What happens if a publisher stops printing and mailing a magazine I purchased through you? A. On average, you will receive your first issue 4 to 12 weeks after you place your order. Generally, weekly subscriptions will take about 4 to 10 weeks to start and monthly subscriptions will take 6 to 12 weeks to start. There is very little difference in the processing time whether one orders directly through the publisher, or through a subscription reseller, like ReceptionMagazines.com. This time period applies to both new subscriptions and renewals. We also guarantee that you will get your subscription within a maximum of 12 weeks, but on average, all it takes is 4 to 8 weeks. If you do not receive your first issue within 12 weeks then the subscription is on us, and you will receive a full refund for the magazine. A. Absolutely. You will see the option to renew on the magazine page. Please note that the publisher processes renewals within a similar timeframe as mentioned above (4 to 12 weeks). A. No need to do that. The publishers will already have you in their database. All you need to do is ensure that the name and address you give us is the same as the name and address of your current subscription. The publisher will take care of the rest. A. 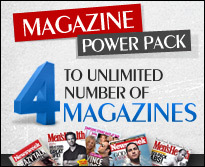 We offer a pro-rated refund on the unused portion of your magazine subscriptions. Just let us know when you would like to cancel, and we will take care of everything. A. After you place your order, you will receive a confirmation e-mail from us. Soon afterwards we will submit your order to the publisher through our clearinghouses. The publisher will then add your information to their database and will ship the magazine to you via the U.S. Postal Service. After you receive your first issue, your account can be handled by the publisher, and ReceptionMagazines.com. ReceptionMagazines.com has access to your account. As mentioned above this whole process takes 4-8 weeks, on average. A. We can ship only to the 50 U.S. states. A. To change the information on your mailing label, send us an email to Support@ReceptionMagazines.com or visit our contact page. Please be sure to provide us with your name, address and order ID, so that we may properly assist you. A. We accept Visa, MasterCard, American Express, Discover and Paypal. We accept orders via our website and by phone. Q. What happens if a publisher stops printing and mailing a magazine I purchased through you? A. Periodically, a publisher may fold or cease printing a title for various reasons. In the event of such an occurrence, the publisher will automatically switch your subscription over to a different magazine with comparable content. If for whatever reason you are unsatisfied with this replacement, please contact us and we will fully refund the remainder of your unused issues.